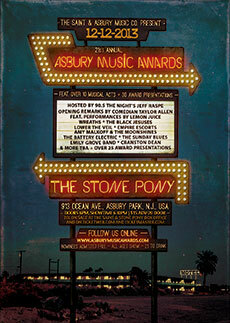 ASBURY PARK, NJ - The 21st Annual Asbury Music Awards return to the legendary Stone Pony on Thursday, December 12, 2013. Presented by The Saint and Asbury Music Co., the Asbury Music Awards will once again be hosted by the iconic DJ Jeff Raspe of 90.5 The Night WBJB-FM Brookdale Public Radio fame. Featuring over 25 award presentations including a new category for Top Music Video, musical acts, special guest presenters and opening remarks by Comedian Taylor Allen. Musical performances by Lemon Juice, Wreaths, The Black Jesuses, Lower The Veil, Empire Escorts, Amy Malkoff and The Moonshines, The Battery Electric, The Sunday Blues, Emily Grove Band, Cranston Dean and more to be announced. Doors open at 6:00pm and the show will begin promptly at 6:30pm. The AMAs is an all-ages event and 21 to drink, advance tickets are available now for $15 at The Saint and The Stone Pony Box offices and on Ticketweb and Ticketmaster. Admission will be $20 at the door. All nominees will be admitted free. This year's AMA nominees will be released via social and print media in early December. The Asbury Music Awards have featured many amazing moments over the years and dozens of today's top local artists received their first burst of recognition with either an outstanding performance or by receiving an award at the AMAs. Each year, the Awards honor distinguished members of the local music community and beyond, but make it a point to celebrate up and coming artists. Over 25 awards are handed out, while musicians, fans and industry insiders take note. The AMAs work closely with a wide variety of music industry insiders - artists, labels, writers, radio stations, print media, festivals, agents, promoters, publishers, and so on - to help organize and build the infrastructure necessary for all genres to be celebrated and to achieve well-earned recognition. Much goes on behind the scenes on a year-round basis in planning and preparation for the Asbury Music Awards. Working smarter, not just harder, means achievement of greater success for the greatest number of artists. The nominees and performers are selected by a panel of industry veterans which includes musicians, artists, promoters, sound technicians, radio personalities, club owners, industry insiders, labels, and music writers. Artists that have progressed to a major label or those who have won or been nominated for a particular category for five consecutive years at the AMAs remain eligible for �Record of The Year� and �Best Thing To Happen in Asbury Park," and may appear onstage presenting or performing during the ceremonies. However, they graduate from being nominated from most categories, making room for new and emerging artists, musicians, and singer/songwriters. After the carefully chosen Asbury Music Awards panel convenes and chooses the performers and nominees, the names of the nominees for each category are compiled in ballot format and distributed to a select group of music industry insiders, devoted music fans and the local music scene. The voting process is not open to the general public, but much effort is put into selecting voters. This method has proven most equitable, as it precludes "ballot stuffing" than can skew results. Area clubs, musicians, music-related businesses, record stores, radio stations, newspapers and time tested music enthusiasts are all represented in the final voting process. Ballots are painstakingly counted, votes are tallied, and the winners are revealed for the first time at the Asbury Music Awards ceremony. A variety of local music alumni, past award recipients, sponsors, and industry professionals are invited by the panel to present awards each year. 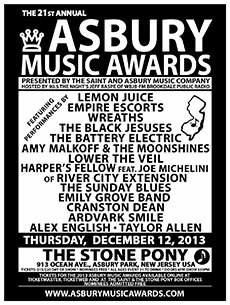 The Asbury Music Awards have been going strong and growing rapidly for more than 20 years, celebrating local musicians, artists, singers/songwriters and the music community in support of live original music. Over the years, the Asbury Music Awards stage has been graced by New Jersey luminaries Nicole Atkins, Rick Barry, Scarlet Carson, Accidental Seabirds, Thomas Wesley Stern, Status Green, Kid With Man Head, Outcry, Samhill, Evelyn Forever, Barry and The Penetrators, What About Frank, April Smith, Woodfish, Stringbean & The Stalkers, The Amboys, Brown, Last Days of Empire, Green Tag Sale, Last Perfect Thing, Outside The Box, Low Flying Jets, Lance Larson, Twine, Keith Kenny, Matt O'Ree Band, Parlor Mob, Eryn Shewell, Allie Moss, Ready Make Breakup, Maybe Pete, Christine Martucci, Tony Tedesco, Days Awake, Sekond Skyn, Chemtrail, River City Extension, Quincy Mumford & The Reason Why, The Black Clouds and Laura Warshauer, to name just a few. For more information on the 21st Annual Asbury Music Awards, contact Scott Stamper, The Saint/Asbury Music Company - by email: [email protected], or visit Asbury Music Awards online at www.facebook.com/asburymusicawards, www.asburymusicawards.com, www.facebook.com/asburymusicfactory, and/or www.thesaintnj.com.